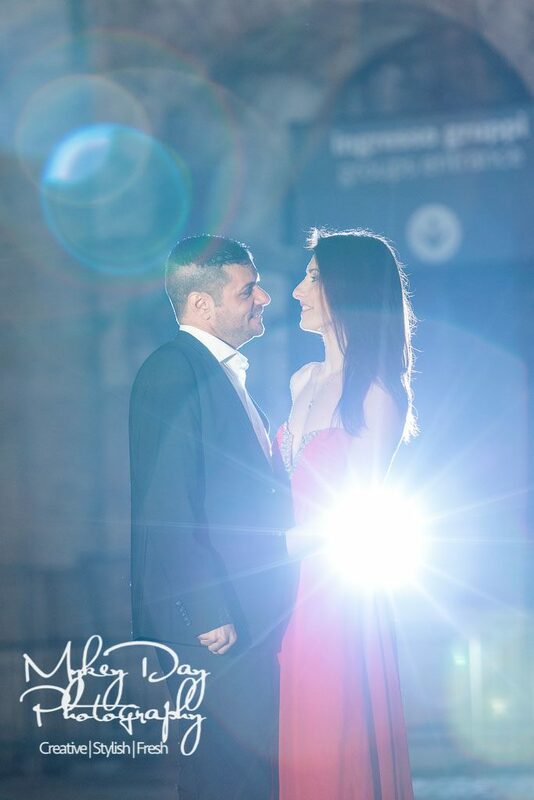 This Pre- Wedding photography for Tania & Mirko in Rome, Italy was an extremely enjoyable and challenging experience for us as wedding photographers. 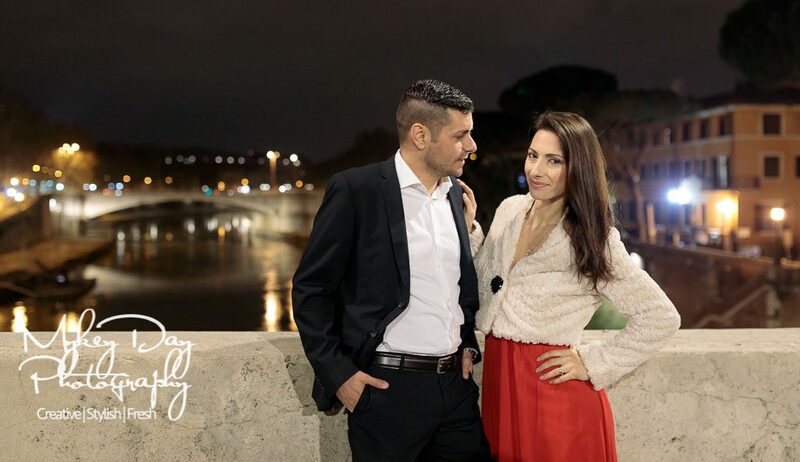 So many beautiful sites, such as The Colosseum in Rome, the Pantheon in the city centre, the Spanish Steps, St. Peter’s Square, and the Lungotevere by the Isola Tibera, it was important for us to capture the best photos for this beautiful couple. Tania & Mirko have planned a beautiful Cathedral wedding in April 2018, in the small city of Latina (approximately 30 minutes from Rome on the Mediterranean coast). So it was important that their engagement photos were just as beautiful as their wedding photos will be. It was a very pleasant and enjoyable night, spent with a lovely couple who allowed me to shoot amazing pictures in the fantastic location for a Rome Wedding. Please see below a selection of photos from their pre-wedding photography session. Enjoy! Tania & Mirko have actually been married before, but are now planning a glorious religious wedding in Tania’s home town of Latina. We were lucky enough to have been introduced to Tania & Mirko by our colleague and friend in Rome Lucia ‘The Love Planner’, as Tania & Mirko were keen to find wedding photography for their beautiful wedding in Italy that will match the occasion. 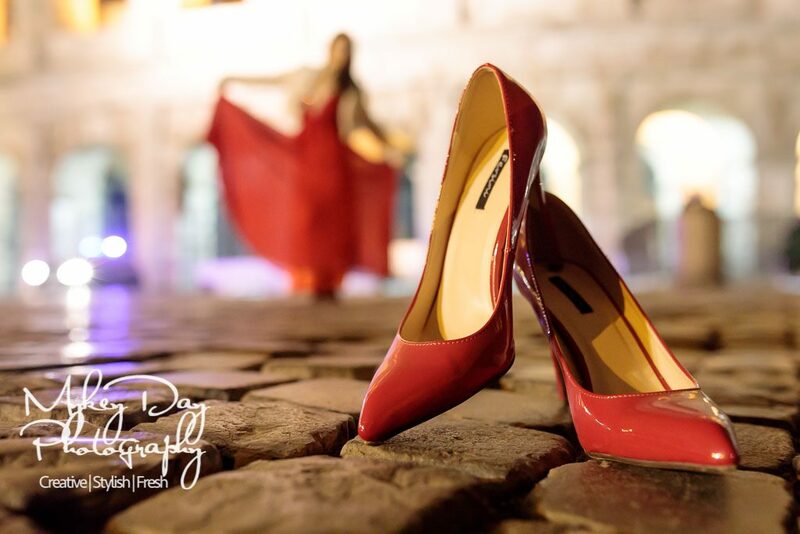 They were well-prepared for the shoot, having looked through our pages on what to wear, what to expect, and brilliant places in Rome to shoot, read the reviews, and even spoke to some of our previous clients on Facebook! We spoke a lot on Skype, WhatsApp, and on the phone. This is a crucial part of planning your engagement photo shoot in Rome. More importantly, we became friends and grew to really trust each other. Most of my clients and readers of this blog know that traditionally we start wedding shoots (too) early in the morning! This is crucial so as to visit the best sites in Rome when all the tourists and locals are still sleep! Unfortunately, because of child care issues 6am was just not possible – but no problem! We have the skills and technology to make beautiful night time photos in Rome as well! 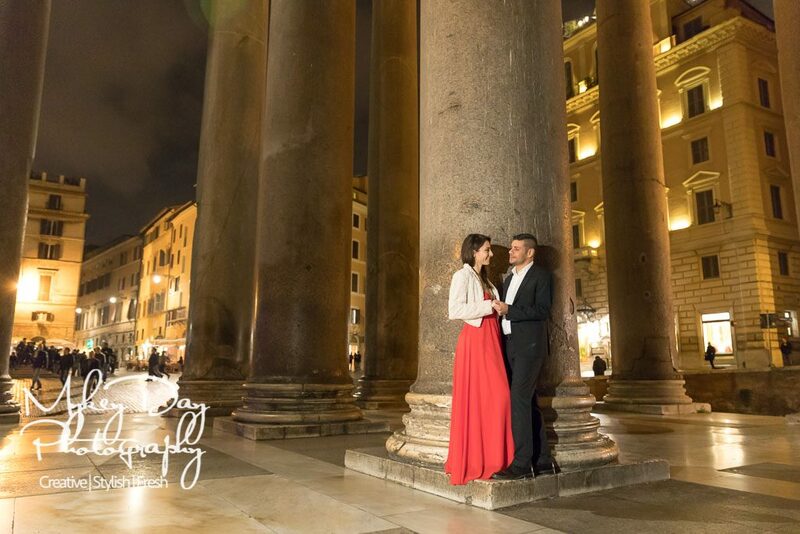 Where to Have Engagement Photos in Rome? We decided to split the shooting into three: the session in Rome beginning with a formal dynamic landscape style of photography near the Colosseum and the Pantheon, becoming more casual and fun at the Pantheon moving on to the Lungotevere. By shooting at night it was easy and quick to visit the most beautiful places in the Italian capital, with fewer people around. 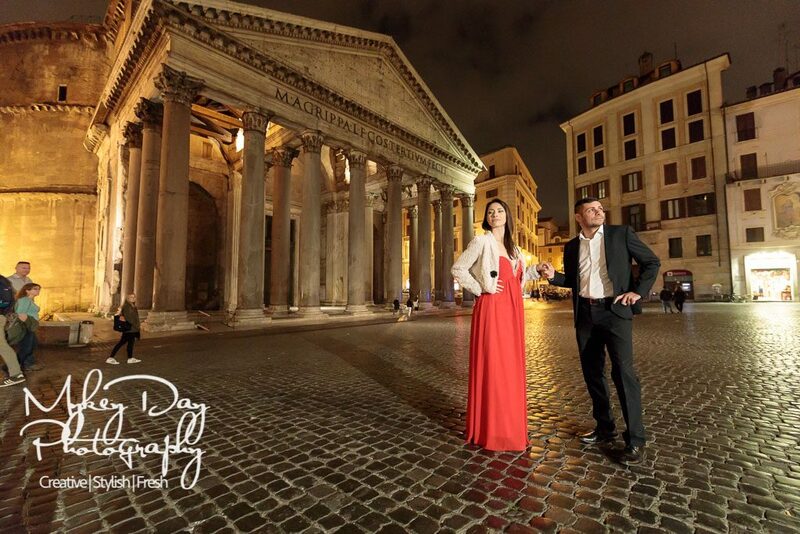 We began the engagement photo shoot in Rome at 9pm. It was the beginning of Spring, but nevertheless the weather was perfect and not too cold at night. The first background for the pre wedding session was the Colosseum — the most powerful and recognisable symbol of Italy and Rome. 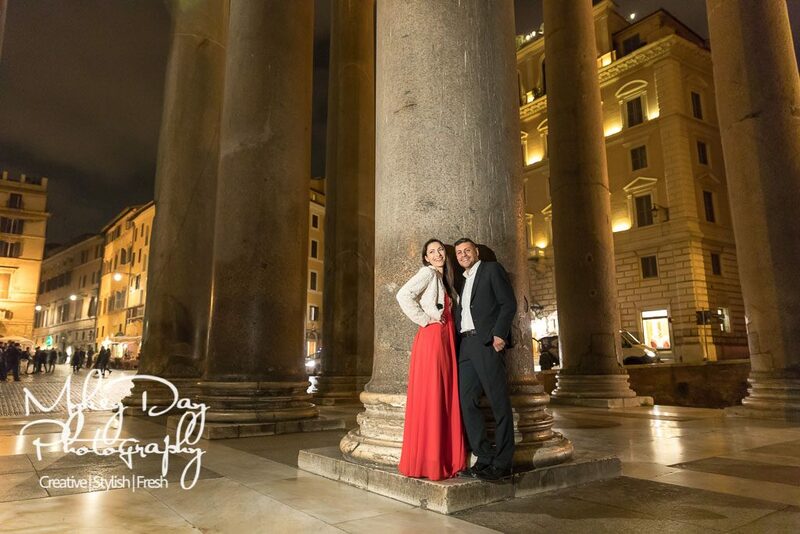 After the dramatic colosseum wedding photos we drove to the Pantheon for the second part of the engagement photo shoot in Rome. The crowds were still around in their masses, as the Pantheon is a very popular tourist location (even when it’s closed), but we did manage to get some lovely pre-wedding photos. 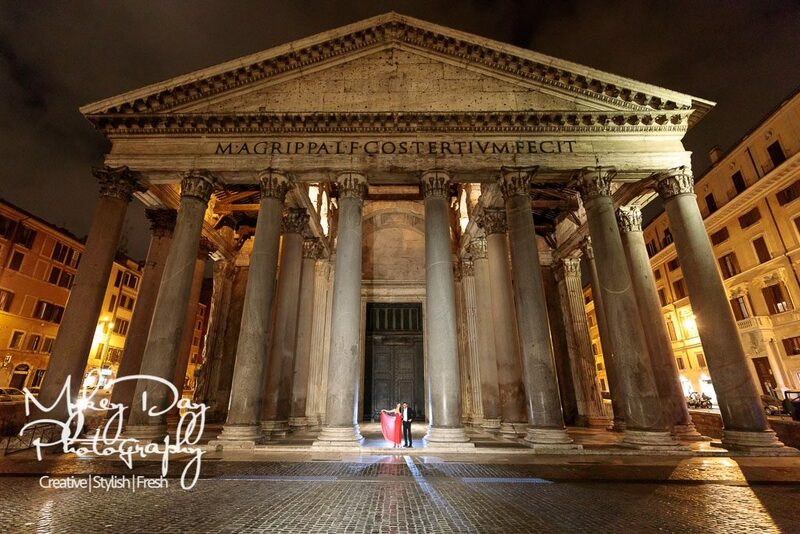 After some fun at the Pantheon, we could have finished our session there – but Tania & Mirko were so excited we carried on and drove to the Isola Tibera for some more intimate photos of the two of them. This is perfect practice for the wedding day, and guarantees beautiful imagery on the wedding day itself. After the session we went back to the Colosseum to share a traditional Italian dinner at Il Riccione’s Pizzeria (highly recommended if you are ever in the area!). We can’t wait to see you again for your big day in April next year!